The Lost World: The Lost World Premières! 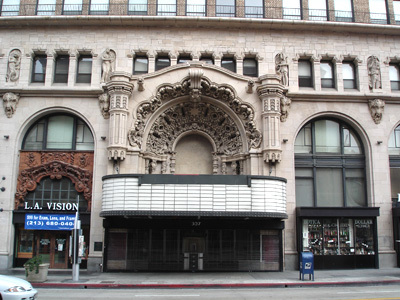 The gala premiere of The Lost World took place on June 18th, 1925, at Sid Grauman's stunningly gorgeous Million Dollar Theater in the heart of downtown Los Angeles, on the corner of Third and Broadway. In addition to the cast, the Los Angeles Times (June 17, 1925) reported other "screen notables" in attendance included Edda Hopper, Shirley Mason (Jim Hawkins in 1920’s Treasure Island), Edward Earle (1928’s The Wind), Barbra Bedford (1920’s Last of the Mohicans), Claire Windsor, Clara Horton (Becky Thatcher in 1917’s Tom Sawyer and 1918’s Huck and Tom), Maryon Aye, Anna Q. Nilsson (both the 1923 and 1949 versions of Adam’s Rib), Dorothy Sebastian, producer Al Rockett, Dave Thompson, director Edwin Carewe, Mary Akin, Viola Dana, Maurice “Lefty” Flynn, Blanche Sweet and Marshall Neilan (1915’s Madame Butterfly). 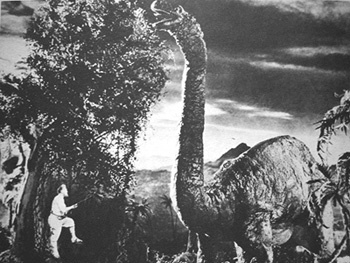 Just over 10 days later, The Lost World was reported breaking attendance records at the Million. The same paper, on June 14, 1925, ran the headline "If Mr. Diplodocus Should Visit Town": "thousands terrified- Buildings toppling to the earth - Automobiles and street cars crushed - Tunnels, sidewalks, streets ripped, torn up - Frenzied pedestrians, panic stricken, fighting for escape - This is not a description of what an earthquake might fo but what would probably be the fate of Los Angeles if a dinosaur of a prehistoric area were to be reincarnated and run amuck on Broadway... If a... monster of the Jurassic Age were to break loose in Los Angeles, the opinion is expressed that the gigantic reptile would be even more scared than the human beings he encountered, regardless of the fact that the people would scatter like chaff. He would bump things pretty severely, it is opined. A flip of his tail would be enough to bowl over the Times Building. He might stick his head through a window of the Million Dollar Theater… where ‘The Lost World’ will be shown Thursday… and knock out the major portion of the structure’s front... if man had not yet invented firearms, the opinon is expressed that it would only be a matter of a few years before the last man on earth would be gobbled up." 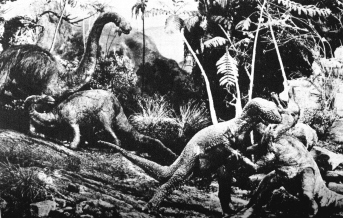 The article was joined by a wonderful doctored photo of The Lost World's Brontosaurus stomping down Broadway in downtown Los Angeles. "For the last six months Washington cinema fandom has been whiling away anxious hours in impatient anticipation. Now the dream is about to come true. Away back last summer... came the word that the movie folk were up to something - that bigger and better things were in the offing - there were whisperings, and, oh, all sorts of rumors going about and we were, parenthetically speaking, on edge." These were the words with which Jack Y. Lad - in the November 8, 1925, Washington Post - heralded the arrival of The Lost World in Washington D.C. The film, however, posed a unique challenge for reviewers and copywriters. Lad recalls "For once in his life [Nelson Bell of the Metropolitan Theater] confessed that his pen was lost when it came to telling about 'The Lost World.'" Lad continues: "'I'm going to be honest with you fellows,' he said, shouting through his megaphone at the dramatic departments of five newspapers, 'if I wrote what I could about 'The Lost World' you wouldn't believe a word of it'... So what did he do but make all us morning newspapermen get up early Tuesday and journey downtown to a pre-showing of the film." That they did. The social papers of the Post for that same day reported that "Harry M. Crandall, founder of the circuit of theaters bearing his name in Washington and vicinity, was host last Tuesday to the dramatic editors of the Washington newspapers at a private pre-view of First National's production of 'The Lost World,'... this week's attraction at Crandall's Metropolitan theater. Following the screening... the members of the Fourth Estate were Mr. Crandall's guests at luncheon at the Mayflower hotel." Lad observes that "Nelson has the right idea. This picture is just one of those things that must be seen to be believed. It is what the old boy himself calls 'the most astonishing achievement in the history of the silent drama.'" The Nov. 16th Post heralded the film, saying "The story is a screen adaptation accomplished with unbelievable realism... all manner of huge monsters roam about the place and lend the action an eerie sort of suspense that is baffling." The day before, they stated that "Many utterly baffling photographic effects are achieved and in numerous other respects 'The Lost World' is in a class completely by itself." The Nov. 8th review noted that "Necessarily, the love story... loses something of its normal appeal by the environment in which it is enacted." The length of The Lost World required the curtailling of the usual theatre program. The symphonic overture was excised, and in its place, the Metropolitan Theater's symphony under conductor Daniel Breeskin played the largo movement of Dvorak's New World Symphony as an introduction. 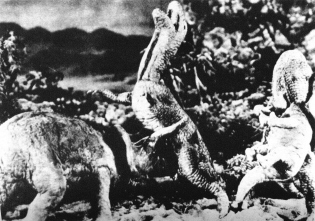 Breeskin's score included leitmotifs of Love Everlasting and Rudolph Friml's The Lost World. The conclusion was the song Miami from Al Jolson's Broadway production of Big Boy, which played in January through March of 1925. The Lost World was held over for a second week at the Metropolitan. After that November engagement, it enjoyed a second December engagement at Crandall's Tivoli theatre. 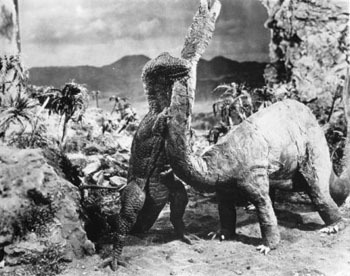 Indicative of The Lost World's success, it was originally slated for a six-day engagement at Toronto's Regent Theatre but was held over for three weeks. After that, it returned to Toronto's Tivoli Theatre in November. According to the Washington Post, The Lost World played in most major American cities with admission ranging up to a whopping $2.20. Adjusting for inflation, that is a ticket price of approximately $25... The Lost World was a true blockbuster event movie of its day. The Lost World also received another important distinction: one of the world’s first in-flight movies in an aeroplane. This historic showing was on Monday, April 6, 1925 during a 30-minute Imperial Airways flight from London to Paris. It was also shown the following day to a special party of 12 persons in an hour-long circle flight around Croydon, England. Not to be outdone, the German Air Service Company premiered it on Feb. 4th, 1926 during a flight over Berlin. 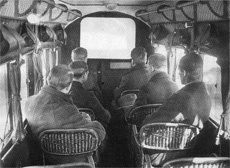 The very first aeroplane in-flight movie was shown as an exhibit during the 1921 Chicago Pageant of Progress. Fitted with a screen and projector, the Santa Maria hydroplane circled the Windy City as it showed the promotional film Howdy Chicago! In these earliest days, in-flight films were media stunts used to capture the imagination of a seat-buying public. Regularly shown films on commercial flights would not come until the 1960’s. However, Howdy Chicago!, funded by the Chicago Boosters Club, was itself produced by Watterson R. Rothacker. 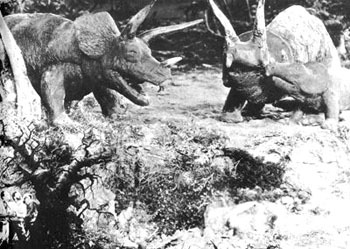 After three years of tests and production, The Lost World was finally completed on February 2, 1925. 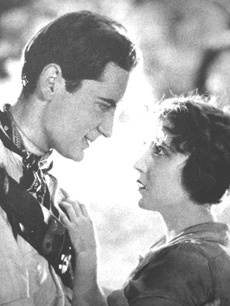 At a cost of $1 million, it was one of the most expensive films of its day, compared to $200,000 or less for the average silent movie. Thanks to the hard work of everyone involved, from producers Watterson Rothacker and Earl Hudson, director Harry Hoyt, effects crew Willis O’Brien and Marcel Delgado, writer Marion Fairfax, and the cast of Wallace Beery, Lewis Stone, Lloyd Hughes, Bessie Love and Bull Montana, the film was a critical and a box-office success. where The Lost World held its gala premire. New York Times, Feb. 9, 1925. Through wonderful photographic skill and infinite patience in the camera work, Sir Arthur Conan Doyle's fantastic story, "The Lost World", makes a memorable motion picture, weakened by some subtitles and the unnecessary inclusion of countless protestations of affection by both the hero and the heroine at inopportune moments. Los Angeles Times, Feb. 25, 1925. "The Lost World" may be classed as an animal picture, but anybody who sees it will have to admit that the best circus in the world was never anything like this. The tang of a real adventure fills the theater from the very start of the film, and it arouses at times gasps of wonder and amazement. technically it is so startling, in fact, as to be hailed as a masterpiece. Movie Weekly, March 7, 1925. Globe and Mail, April 2, 1925. Globe and Mail, April 9, 1925. Toronto Star, April 13, 1925. The question on everybody's lips is: "How did they do it?" and research books are much in demand to learn some details of the antediluvian monsters that have been compiled by sceintists and students who have always found this subject an intriguing one... One scientist who saw "The Lost World" says of the dinosaur family - "Of all the dinosaur family, the allosaurus is the most formidable. In the Jurassic period he was a mighty meat eater, as big as six elephants. 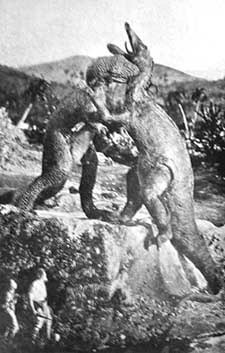 He had claws as big as a man’s forearm and teeth two inches in diameter; these are the two creatures I should say, that are shown in this wonderful motion picture." Toronto Star, April 16, 1925. Press and public alike are unanimous on the subject of the extraordinary picture adapted from the novel by Sir Arthur Cnonan Doyle "The Lost World" whch is one of the most popular motion pictures ever shown in Toronto... "The Lost World" has surprised even the most sophisticated theatre goers. Toronto Star, April 23, 1925. Picture Play Magazine, May 1925. "The Lost World" has the great merit of being something new. If it falls down, at least you can only say that its worst moments are not more than commonplace movie. I think it was the idea of Mr. Watterson Rothacker to transfer this fantastic story by Conan Doyle to the screen. And it was no ordinary thing to attempt, for it is a weird tale of an inaccessible plateau near the Amazon inhabited by the animals of thousands of centuries ago... It really is wonderful movie business and one of the most imposing novelties of the year... It is unfortunate that it was necessary to introduce a silly love story and a lot of tiresome modern stuff into an otherwise excellent fantasy. After all the strange animals and the weirdly beautiful settings, you have small patience with the foolish explorers who found them for you... However, the director made the animals much more real than the humans of the story and there is lots of nice, shivery scenery and a rampageous volcano. The Times, June 13, 1925. Washington Post, November 5, 1925. The most astounding achievement in the history of silent dama will comprise the principal attraction at Crandall's Metropolitan theater next week... Here is a picture that has never had a counterpart. Washington Post, November 15, 1925. Here is a picture that has never had a counterpart in the history of silent drama. In it has been reproduced and animated with astounding realism the terrifying animal life that is reputed to have existed on this earth one hundred thousand centuries ago - pterodactyls, brontosauri, diplodoci, trachodons, triceratops, allosauri, megalosauri, and all of the other horrendous creatures that measured hundreds of feet in length and towered into the air like our present-day skyscrapers! Toronto Star, November 24, 1925.